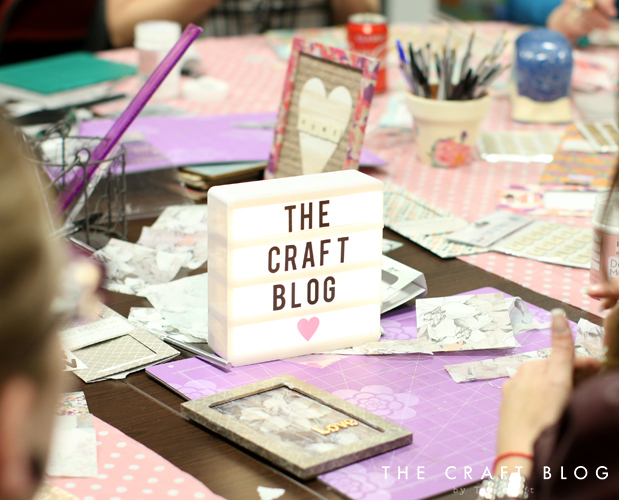 To celebrate our brand new website we organised a brilliant bloggers day event to show off the shiny blog and to do what crafters do best, get our craft on! No bloggers day would be complete without balloons, sweets and so many crafty goodies. We had so much fun decorating the office on Friday! The day was jam packed with sneaky peeks of upcoming craft collections, diving in to craft tutorials and showing off all the new functions of our site, The Craft Blog by Trimcraft. Everyone loves a crafty home décor piece so to begin the day Maxine showed us how to decorate wooden frames with a variety of First Edition Deco Mache papers, from old loved designs to our latest patterned decoupage papers! Everyone created such stunning frames in their own, unique style. We just adore a Craft Challenge, so we asked our bloggers to create absolutely anything in under 20 minutes! There was so much tension as everyone die cut and glued to their hearts content but everyone did a brilliant job! We had decorated our office with a follow board so we could all follow each other and make new online friends. A particular favourite of ours was our fabulous 'Selfie Centre' where you could take a selfie amidst so much colour and crafty goodness- we had to take advantage of it! No'one can resist adding to their stationery collection so Kathy took everyone step by step to craft their own notebook with their favourite craft papers and adhesive letters. These personalised notebooks would be a real treat to use for all your important to do lists! In between different craft sessions, we set up our photography room for the bloggers to take snaps of their projects. This was definitely a popular area as they had access to our fab props too. No crafternoon is complete without food so we had a real feast to dig in to, including the cutest little cupcakes- these were seriously scrumptious! Later on in the afternoon, Claire showed everyone how to make the prettiest origami flowers, the perfect home decor piece for those who love to inject a colourful and crafty feel in to their home. All the bloggers received a bag full of goodies and a pin to remind them that they are always crafter of the month! We have also uploaded a video of our fantastic day which is definitely worth watching (maybe with a cuppa as it's quite long!) We would all like to say another big thank you too all those bloggers who travelled to our special day, it was so lovely meeting and crafting with you!